Business standard organised a quiz competition for PGDM students on 8th Feb 2018 in which more than 100 students participated in the quiz. The purpose of business quiz was to assess and enhance the knowledge of students related to business environment. There was a tie between the constestants for second runner up position. 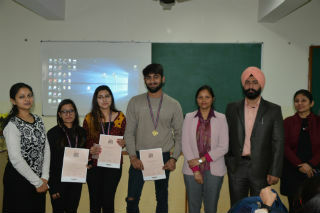 The Finalists were Kunal Dua, Megha Gupta,Vaishali and Jatin Arora. 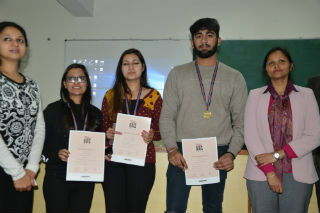 A tie round was organized and out of these four finalists , Megha Gupta bagged 3rd position. Ayush Khurana secured 1st position of PGDM Batch ( 2017-19).The second runner up for the quiz was Drishti Sharma . All the participants were given certificate and medals for respective positions.